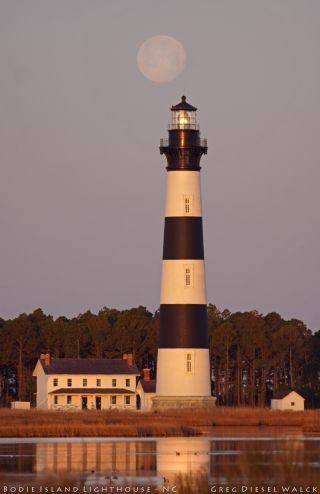 Greg Diesel took this image of the moon over the Bodie Island Lighthouse in the Outer Banks of North Carolina. A rare moment catches a photographer's eye in this stunning night sky photo. Veteran night sky photographer Greg Diesel Walck took this image of the moon over the Bodie Island Lighthouse in the Outer Banks of North Carolina during the Easter full moon in April. The Belt of Venus is the pinkish streak caused by the atmosphere reflecting light from the setting or rising sun — giving the reddish hue seen in the image.